Matthew Ritter's interest in epitaphs began in junior high, when a history book displayed the haunting message on the grave of an ancient Roman: "What I am you soon shall be." He started writing epitaphs of his own in the margins of his notebooks, summing up the imaginary lives of imaginary people in a few concise lines. 14 Hours Productions recently released Welcome to Boon Hill, a "graveyard simulator" where Ritter finally got a chance to put those skills to work. 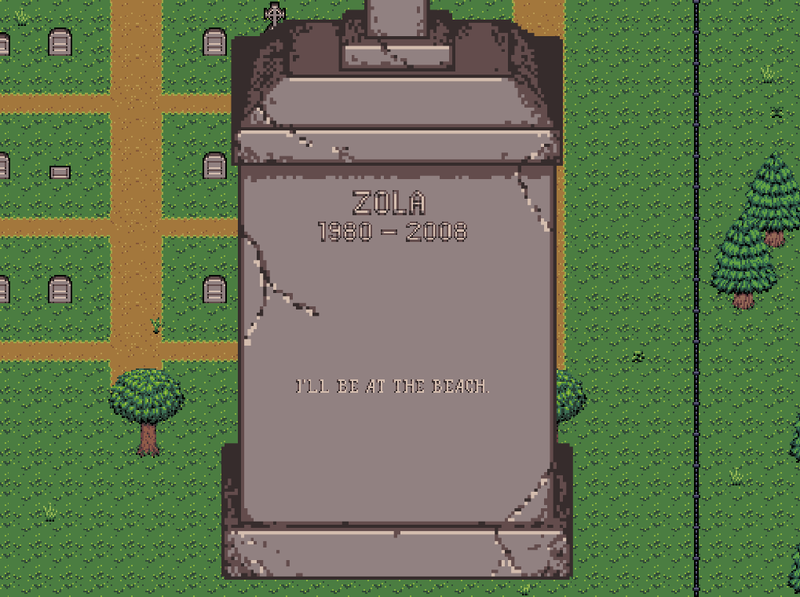 The game is exactly what it sounds like, and little else; your character arrives at a 16-bit graveyard called Boon Hill and wanders around at their leisure, reading the messages carved into over two thousand graves. There are no surprises, no jump scares, nothing to collect or achieve, except perhaps insight into your own mortality. The game is also partly inspired by Spoon River Anthology, a poetry collection that tells the story of a fictional small town through the verses on the epitaphs of its inhabitants. While Welcome to Boon Hill isn't quite so cohesive, the graves you read feel a little bit like creative prompts that can start to form a larger picture in your mind. Sometimes their message is concise: how someone died and when, a life in two bullet points. Other times they suggest a much richer story, or offer some sort of takeaway: a moral or a cautionary tale to guide the living away from their mistakes. And then, of course, there are the graves memorializing people who aren't much older than you—maybe they're even younger. After a while, it's hard not to think about what someone would write on your grave if you died today, or at least how you'd want to be remembered. Have you done enough? Have you loved enough? "I feel there's something to be experienced by exploring a graveyard, just for the sake of exploring a graveyard." Ritter explains in a trailer for the game. "It's not really about death, it's about life. Epitaphs are written for the living." Welcome to Boon Hill is available now on Steam for both PC and Mac.